To improve your marketing education and skills? To advance your career through a marketing qualification? To earn more? To work in another country? Whatever your aim and wherever you wish to go, our aim as a marketing school is simple. It is to help you fulfil your ambition by providing marketing education, marketing training and marketing qualifications as good, if not better, than anything available through any European marketing school or even the best business school anywhere in the world. And we make it possible by combining traditional, proven face-to-face pedagogy with distance learning using the very latest digital technology. In fact we are the first European business school to offer anything as comprehensive.Click here to read what people say about us. That’s quite a claim, isn’t it? How can I make it? Because I’ve spoken at top business schools in Europe, the U. K., the U. S. A, Latin America and China. Many don’t cover direct marketing at all; none does so in as much depth. 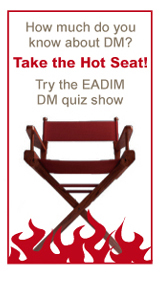 Go now to the page “EADIM Certificate in Direct and Interactive Marketing”. It is the first marketing course specifically created for not just one but many European countries, culminating with a marketing qualification recognised throughout Europe. Now I have told you what we provide. But what must you provide, beyond your ambition. Total commitment. Hard work. Determination. A burning desire to learn. Please explore this site. See the kind of marketing education, marketing training and marketing qualifications we have to offer. Meet some of the people who will teach you. Click here to look at their credentials. As I say, no marketing school anywhere offers anything quite like this. And it is here now, in Europe, for you. Ready to take you wherever you want to go.Book now! Today is the first day of the rest of your life. Make the most of it! P.S. Want to know more about our marketing course? Just click here. By all means ask questions – we will reply.